Game changing news: some day, you’ll be able to get to LaGuardia Airport via train. During a speech Tuesday, New York Gov. 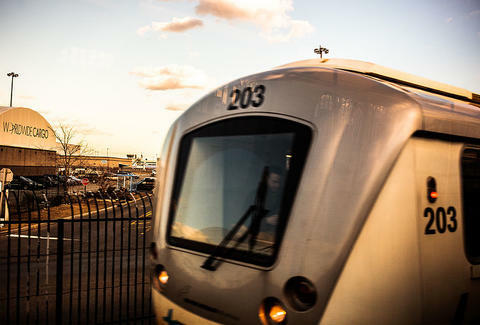 Andrew Cuomo proposed the construction of a much-needed tram that would finally connect LaGuardia Airport to the 7 subway train and the Long Island Rail Road near Citi Field in Queens, according to the The New York Times. The proposal, which is still in early planning stages, calls for a 1.5mi tram along Grand Central Parkway connecting the airport to the Willets Point 7 train and the LIRR stations, Cuomo said. The trains will likely be similar to those used to connect travelers to JFK and Newark. Currently, travelers flying through LaGuardia must get to the airport by car or bus, which Cuomo described as "inexcusable," according to the report. Cuomo did not say when the tram will be operational, but don’t hold your breath — aides to the governor said it will be done within five years, according to the Times. Lauded by some as a breakthrough, the plan comes almost a year after Vice President Joe Biden described LaGuardia as a "third world country." Tony Merevick is Cities News Editor at Thrillist. He was recently in a taxi from Manhattan to LaGuardia for over two hours. It was not enjoyable. Follow him on Twitter @tonymerevick.